Contrary to the name, winter squash is grown in the summer and harvested in the fall. Due to its thick, tough exterior, it can be stored for several months and eaten during the winter season. Winter squash is easily prone to decay, so it is important to carefully inspect it before purchase. Choose ones that are firm, heavy for their size and have dull, not glossy, rinds. The rind should be hard as soft rinds may indicate that the squash is watery and lacking in flavor. Avoid those with any signs of decay, which manifest as areas that are water-soaked or moldy. Winter squash has a much longer storage life than summer squash. Depending upon the variety, it can be kept for one week to six months. It should be kept away from direct exposure to light and should not be subject to extreme heat or extreme cold. The ideal temperature for storing winter squash is between 50-60°F (about 10-15°C). Once it is cut, cover the pieces of winter squash in plastic wrap and store them in the refrigerator, where they will keep for one or two days. The best way to freeze winter squash is to first cut it into pieces of suitable size for individual recipes. 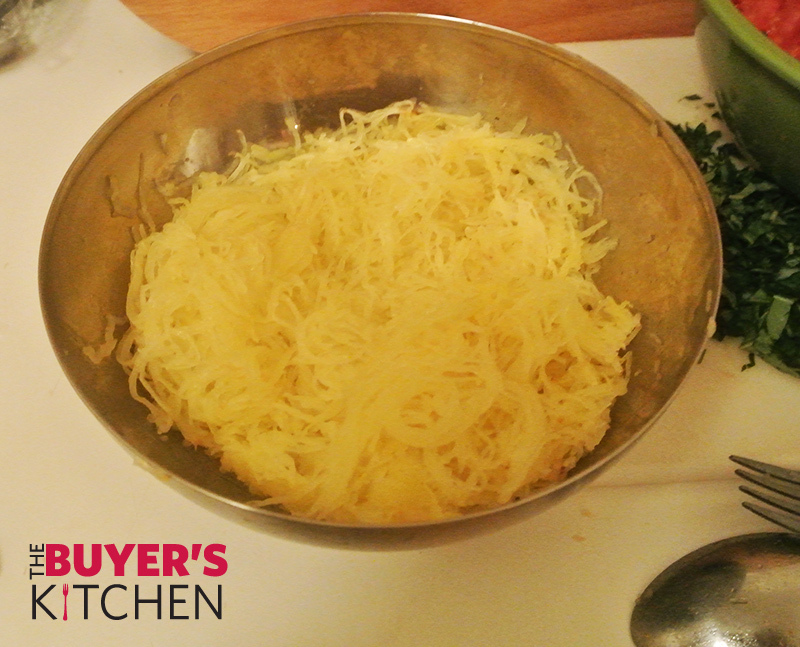 In this post, we’re going to cover Spaghetti Squash, and how to prepare, cook, and enjoy it in Spaghetti Squash alla Checca. 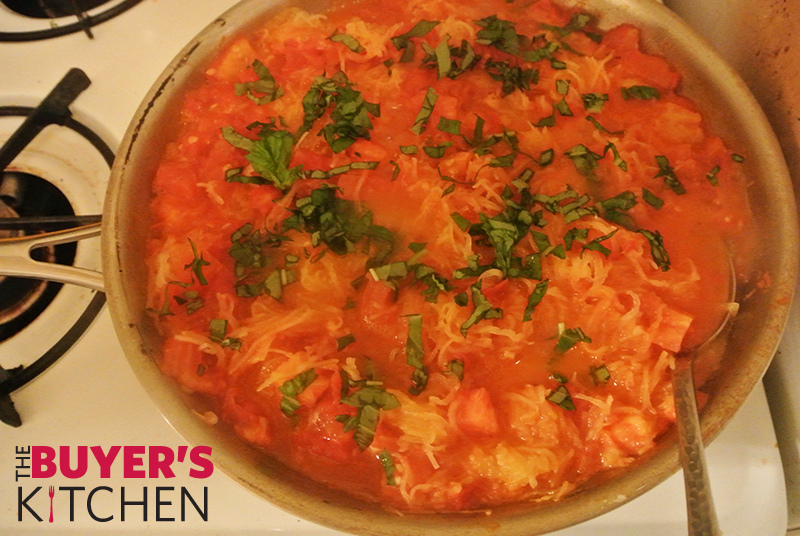 Checca sauce is an uncooked tomato sauce used with pasta, or in our case, spaghetti squash. Typically, this dish is prepared over pasta, but the benefit of spaghetti squash is that it can easily substitute for pasta but at only 42 calories and 10 grams of carbohydrates for one cooked cup, vs. the same amount of cooked pasta, that has 182 calories and 43 grams of carbs. Wow! Bake the Squash: Heat oven to 350. 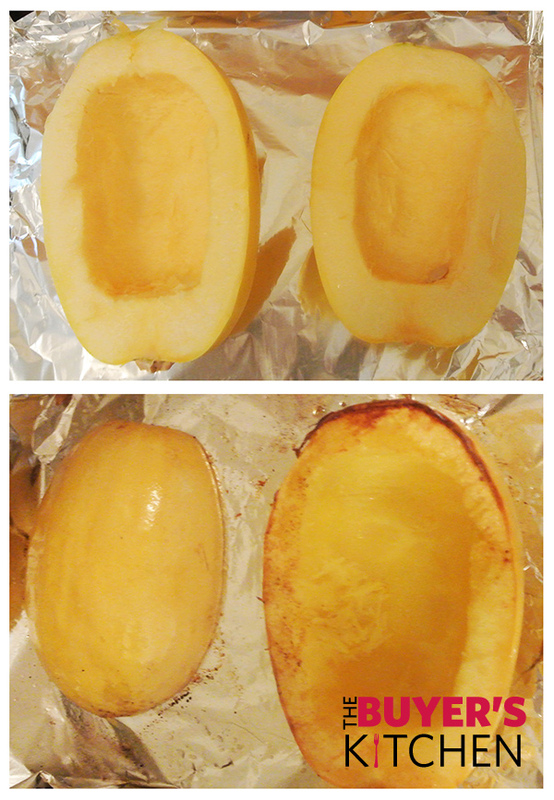 Slice spaghetti squash in half and removed the seeds and innards. Lightly drizzle with EVOO and place face down onto a foil lined baking sheet. Bake for 35-55 minutes (depending on the size of the squash) until tender and cooked through. 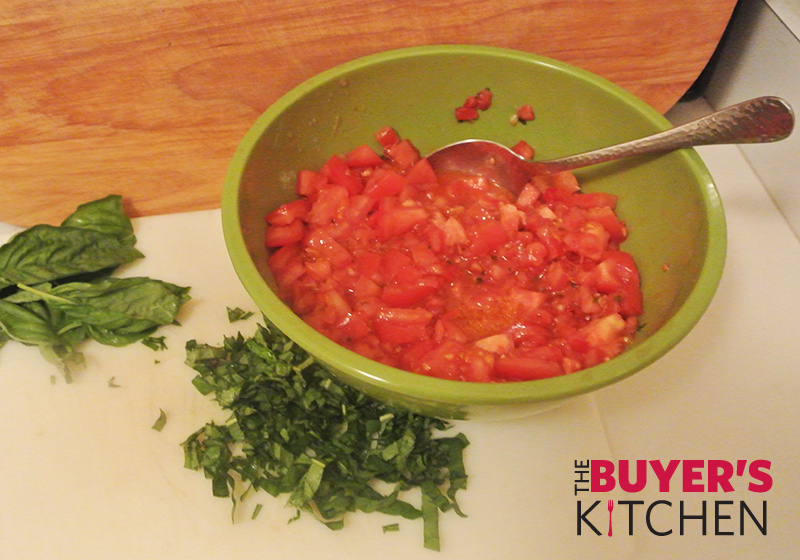 Prep the Sauce: dice the tomatoes, mince the garlic and chop the basil. Add 3 tbsp olive oil in a medium sized bowl along with the garlic and the tomatoes. Season with salt and pepper to taste and set aside. 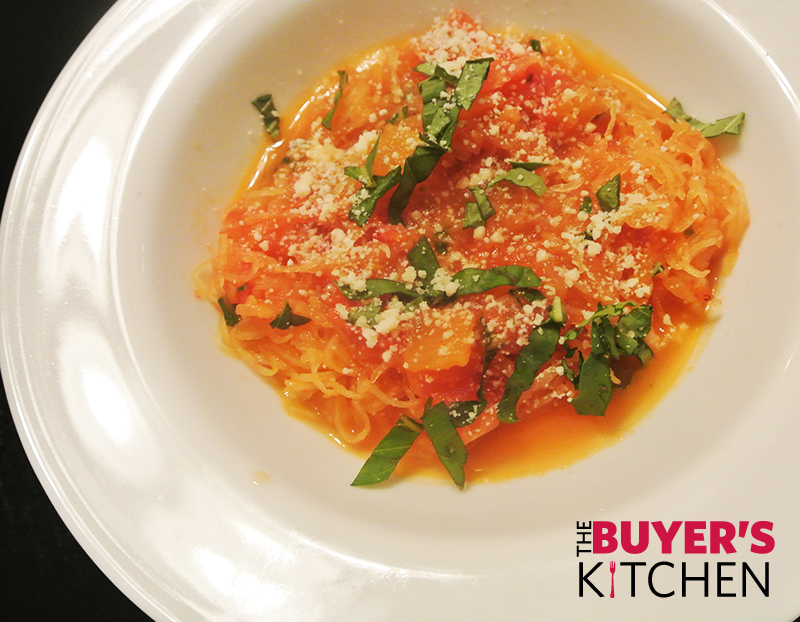 “Spaghetti “ the Squash: Allow the baked squash to cool for 5- 10 minutes. In a medium sized bowl use a fork to scrape the “spaghetti” from the squash. Kick up the Checca! Heat a large frying pan on medium high. Once heated, add the tomato garlic mixture and bring to a boil. Reduce the heat and allow the sauce to reduce until the tomatoes and the garlic are tender. Add half the amount of basil and stir. Next add the “spaghetti” into the pan and mix to incorporate. Serve & Bon Apetito: Plate each dish and garnish the remaining basil and top with Parmesan cheese (optional) and enjoy!